Mix all the ingredients togeather, server chilled with Chicken Biryani, Egg Biryani, or any other kind of biryani. 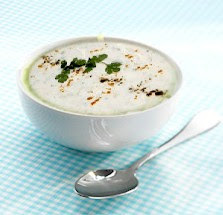 Kitchen Notes: If you think raita is too thick, add a bit of milk. All quantites are approx., changes should be made according to the taste. Thanks for your comment. Do try it and if you like spicy stuff, then add green chilies..Tastes even better! !